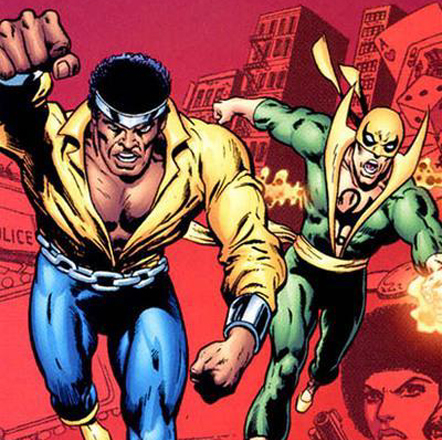 If you were expecting the Heroes for Hire team to join forces in the upcoming Iron Fist Netflix series, we’re sad to report that you’re probably out of luck. In a Facebook Live video with Marvel, Luke Cage actor Mike Colter sat down to discuss the recent success of Luke Cage and to get the inside scoop on The Defenders series that has yet to start filming. A few minutes into the broadcast, Finn Jones (aka Iron Fist) popped by to say hello. Jones remarked that it was the first time the two had actually had a face-to-face conversation. Unfortunately, that means bad news for a Luke Cage cameo in Iron Fist, as Jones said he was currently shooting the season finale of his show. The Defenders won’t start shooting until three weeks after Jones finishes Iron Fist, so if Luke Cage isn’t in Danny Rand’s origin story, the two will meet for the first time in the big team-up with Jessica Jones and Daredevil. Instead, Iron Fist fans can expect more of the singular, character storytelling that Marvel has been doing with each series by focusing on the stories of each character instead of attempting to tie them all together very early. It still remains to be seen how the four Defenders will eventually team up. Maybe it will have a lot to do with Claire Temple, who seems to be the only person who knows everybody. Or perhaps some super powerful villain will make an appearance to catalyze things. Whatever it is, we cannot wait to find out. Iron Fist releases on Netflix March 17, 2017.